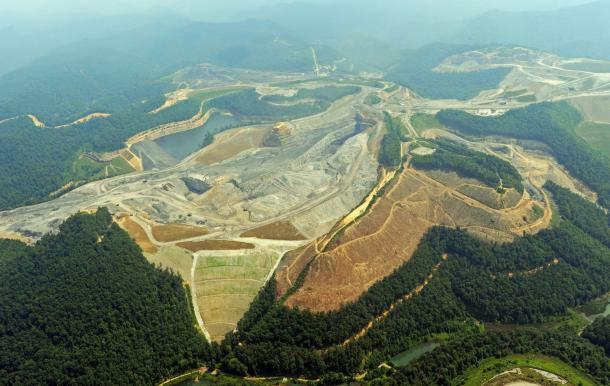 An example of mountaintop removal. Image via blog.sungevity.com/Mountaintop removal might not seem like an issue pertinent to Philly residents, but students at Temple University and University of Pennsylvania would disagree. Local banking favorite PNC is a major financier for companies engaged in the practice. And at Temple and Penn, the relationship with PNC is close. Both universities have exclusive contracts with the bank. Additionally, Penn receives financial contributions from the company and at Temple, J. William Mills III, regional president for PNC, sits on the board. This fall, with support from the Earth Quaker Action Team, who started their own campaign against PNC, Penn and Temple engaged their communities in discussion and activism on the issue. Their work appeared to culminate this past Monday, when the Penn Community Against Mountaintop Removal and their counterpart at Temple individually met with PNC executives in hopes of convincing them to abandon their destructive investment. The meetings, although organized by their respective universities, did little to move the groups’ objectives forward. However, they were a go-ahead for taking their campaign to the next level. Look for more information about the campaign in an upcoming Grid issue. In meantime, find out more about the students’ work at mtratpenn.org and check out a video of Temple students being arrested this fall during a PNC sit-in.